Prince Charles recently gave a speech in which he mentioned the causality behind the Syrian civil war as well as the financial system. "The tragic conflict in Syria provides a terrifyingly graphic example, where a severe drought for the last seven years has decimated Syria's rural economy [...] Driving many farmers off their fields and into cities where, already, food was in short supply. [...] The time then has surely come for our financial institutions to recognise that the Earth is not a limitless resource that can be plundered at will, and to integrate that principle of stewardship into our financial structures." 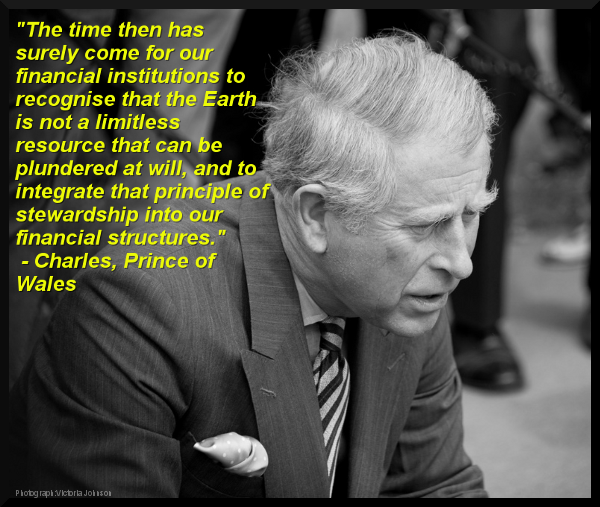 Quote Charles, Prince of Wales. Photograph by Victoria Johnson. When the financial system is man made and our real problems rooted in resource scarcity, desperate needs and whims of nature how come we don't fix the first to at least not limit our ability to fix the latter? Could market fundamentalism have reached a religious grip on our societies? "Modern economic theory is presented as a science. Elaborate mathematics and diagrams are employed to derive principles that are assumed to be universal among economic actors, even though the specialized math used is a “dated version” [...] and such diagrams “often contain outright fallacies” [...] After a closer examination of the dominant economic theory and its critics, one might come to the conclusion that it is actually a belief system quite similar to a religion, not an actual scientific study. [...] The word “economics” comes from a Greek term meaning “management of a household.” As evidenced by the recent meltdown at Fukushima, externalities recognize no national borders. Our household is the entire planet, and we can only make efficient use of its resources by recognizing it as a single system. There is only one biosphere. What happens to it affects us all. We need to redefine economics so that it actually ensures our total well-being to the greatest degree possible while maintaining an ecological balance. We need a holistic economic theory based on empirical data, not traditional notions."